Home Diapering , feature Frugal Diapering: No More Diapers! 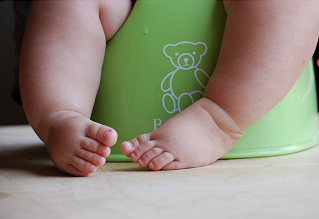 Frugal Diapering: No More Diapers! Lori H. asked: I'm wondering if you know about Elimination Communication ? It is a gentle, natural, non-coercive process by which a baby, preferably beginning in early infancy, learns with the loving assistance of parents and caregivers to communicate about and address his or her elimination needs. This practice makes conventional potty training unnecessary. Basically, the idea is babies know when they need to eliminate, and their caregivers can figure it out just as they know when their baby is hungry or tired, and they can hold the baby over an appropriate place - like a toilet or potty. It's also called Natural Infant Hygiene (because it's what 80% of the world does) or Infant Potty Training . Although the ideal is seen to have a diaper-free in infancy, typically most families using this do use cloth diapers most of the time. And boy, does it make cloth diapering easier!